View more presentations from Fred Zimny. I am a great believer that if you know how a system is structured you will be able to predict how it performs in different environmental conditions. 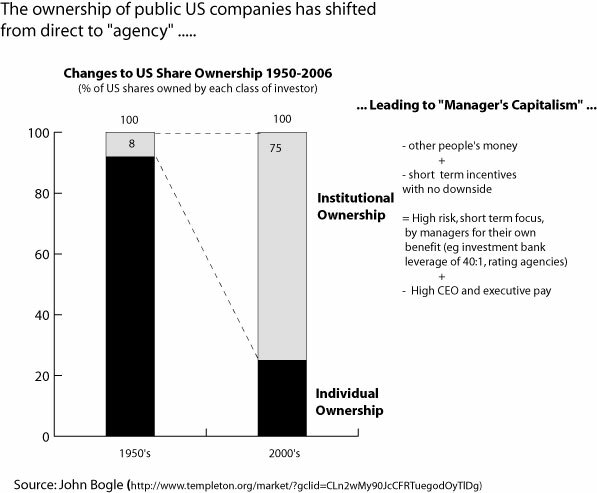 As the chart below indicates there has been a fundamental shift in who owns shares in the USA over the last 50 years. Prior to the start of financial deregulation – which really started with the removal of the constraints of the gold standard in 1971 -shares were predominantly owned by individuals. The majority of shares are now owned by institutions who hold them on behalf on individuals. These institutions compete with each other to deliver the highest returns. Performance is measured by the quarter and Funds managers are similarly rewarded for short term performance – but with zero claw back of performance pay if performance subsequently declines. This leads to herd like behaviour by the institutional funds managers. If the market starts going up – like right now in December 2009 – they need to be in the rising market otherwise they will be left behind in the performance tables. It does not matter if these funds managers know that the markets are overvalued and likely to collapse some time soon. If and when the markets collapse they will once again be able to claim deniability – “we couldn’t see it coming” will be the cry. Fund managers will point to the fact that all the other funds were doing the same – how can they be blamed for not seeing when they are doing the same as everyone else. There is safety in the herd. If you want to know where high CEO pay came from, part of the answer lies in institutional share ownership. As for the gambling behaviour of the Banks – this too took a jump when Investment banks shifted from partnership to public ownership. Who in their right mind would risk leveraging 40:1 with their own money? And right now the situation is even worse. Banks like Goldmans are reporting big profits but these are coming only from trading. The same pattern is in the other banks. The only place they are making money is by high frequency trading – leveraged trading using other peoples money. This in itself is driving up the share market. And when the markets crash and the banks suddenly look sick again it will be high street on the hook again to bail them out. They have now become too big to fail and they know it. They can do anything they want and get away with it. And this is supposed to be Democracy. Yesterday I was talking to an old friend of mine in Zimbabwe, a white guy who used to live next door to me. I asked him what life was like there and how inflation was effecting life. When I left Zimbabwe, one Zimbabwe dollar was about equal to one US dollar. Apparently, at the current exchange rate, if you piled up all the one dollar Zimbabwe bills it would take to buy one US dollar on top of each other they would more than reach the moon and back!! For people like my father who get a government pension, the total annual amount is apparently not enough to buy one coffee a month. But on the other hand there are people who are making big money out of inflation. He gave an example of a common friend who had borrowed the equivalent of US$300,000 for one year from a bank in Zimbabwe. Apparently the moment he got the money he managed to convert it into US dollars. When the time came to pay the money back at the end of the year it cost him the equivalent price of two coffees in US dollars. In other words he had made US$300,000 in one year for the price of two coffees and all he had done was borrow in Zimbabwe dollars, convert to US dollars and hold. So who is losing out on this deal – the average person on the street who has their money in the bank. Yet another case of privatising the gains and socialising the loses. The Zimbabwean equivalent of a Wall street banker. So if you think life is tough in Zimbabwe it is for many but for many others it is still the “good life”. If you simplistically measure the quality of life by the antiquity of the cars people drive then apparently Zimbabwe is doing better than New Zealand! Quiz: Are you a COMMUNIST or a CAPITALIST? To find out simply answer these questions. 1. Do you want fewer and fewer options as a consumer as small independent businesses and genuine free enterprise are marginalised or crushed? 2. Do you want the public to be at the mercy of a small cartel of unaccountable despots? 3. Do you want to be continuously assaulted by relentless propaganda? 4. Do you want your economic system to be doomed to end in failure? If you answered YES to most or all of these questions then YES you are a communist or a capitalist.